I'm so hungry right now. It's 8:13 p.m. and I haven't eaten dinner yet! Absurd. It's in the oven. I realized today that I haven't been 100% honest on my blog because in between my healthy snacks and dinners I have nibbles of this and that there. I'm going to try to either catch myself in the act or start owning up to it. I had many nibbles yesterday but I already forget them. I decided to let myself sleep in until 8:00 a.m. yesterday. What a luxury! I had an exam that I needed to study for so I had to get up early anyway...unfortunately. 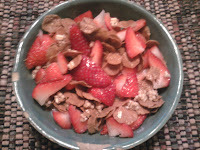 Breakfast was simple-- Fiber One Honey Clusters with strawberries and 1% milk. I've drank skim a lot recently but am finding it's just not really that tasty. Unless you get "super" skim, which is essentially a thicker version--much better. The problem with this breakfast is the lack of fat. I get protein from the milk, and some from the cereal, tons of fiber and carbohydrates, but no fat to keep me satiated. So in a few hours, I'm already hungry. I got coffee before class. Even though I thought it would be this great idea to buy store coffee and make it myself, it never tastes as good! Maybe I need to invest in a new/better coffee pot. So I went to the grocery store which conveniently has it's own Starbucks and when the woman asked if I wanted cream I said "just a little." What I got was half a cup of coffee with enough room for about a half cup of cream. She even had an attitude when I asked for more. I hate unfriendly people. Right before me a woman ordered oatmeal and no joke, the clerk threw everything into the bag as if she had an agenda. It was bizarre. The pumpkin creamer + Starbucks coffee was okay. 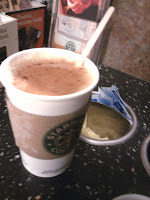 I think Starbucks has too much of it's own bold taste, and wasn't complemented well my the pumpkin. It still tasted good... but something was off. Come to think of it, I think the coffee might have been a little cool. Gross. Anyway, that's entirely too much time spent on my coffee. I forgot to take a picture of lunch!!! Luckily, I had the same sandwich as Monday, so if you're desperate to see, it's up there. Avocado, turkey, ham, black pepper on Oatnut. No mayo or tomato this time...still delightful. Not as messy. I had an apple with cinnamon too. I didn't have a big lunch because right after class I planned on working out and I didn't want to be heavy. I sailed through my exam and soon enough I was leaving the NOVA campus and on my way home. It was soooo nice outside. For a fall day--wow. Bright sun, slight breeze. It was the perfect day for a run. But... I didn't. Ugh, my foot is killing me! (Figuratively, not so much literally). So I went for a walk. Lame, yes. A good substitute, yes. In the past, this would not have sufficed as a good workout, but I'm listening to my body. The pain in my foot/ankle is getting pretty bad. I'm not talking a small sore. So hopefully it will improve with rehab and lighter workouts but I am really bad at taking it easy. 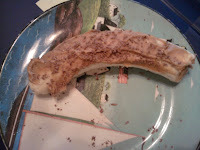 After my walk I was hungry, so I made one of my favorite snacks: banana with peanut butter and shredded chocolate. I know, I know, it doesn't look that appetizing-- but it is. I had plans to go out to dinner and so I had a few hours to kill. Between the few hours I got hungry again. Big surprise. 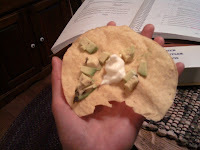 I just had a corn tortilla with avocado and sour cream. A true treat, right? Ha. 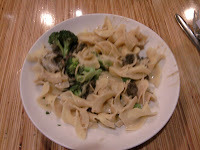 Dinner was at one of my favorites-- Noodles and Company. It's pretty cheap and doesn't feel like "fast food." They also have a section of healthy choices on their menu-- I didn't go that route. Oops. I usually get the Japanese Pan Noodles, which I love, but instead I went with the mushroom stroganoff with extra mushrooms and broccoli. They definitely skimped me. I asked for it instead of meat so I thought they would at least plump it up a bit. Wrong-o. Also, I think they skimped me a bit on the sauce. That's okay in my book, because it was a cream sauce. They call it a "light" cream sauce. I guess it's true advertising. I had a diet soda before dinner--bad idea. Diet soda is sweetened by artificial sugars, which have been linked to causing sweet cravings. When you drink a diet soda, your mind isn't satisfied by the fake sugar, and thus craves real sugar. It also may be because diet soda is so sweet, that you just want more of the feeling. True sugar releases endorphins. Fake sugar, does not. So what can turn into a small nibble of a cookie here or a spoonful of ice cream can lead to a binge. I've tried drinking less diet soda, but when I do... this sweet attack always occurs. I dove right into a bag of candy at home and had a couple Dove Chocolates. Knowing full well what I was about to embark on, I tried tricking myself and I made a caramel apple. 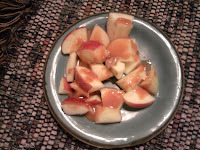 No, this wasn't exactly what I wanted, but the apple kept me chewing long enough for the true craving to pass. And long enough for me to regain control of the situation. I know this probably sounds crazy for all you completely normal eaters out there, but like I said, I've struggled some in the past, and it's really important for me to keep my habits in check. Success... sort of. I'm getting better as I keep posting. I feel bad posting a lie, so I just don't. Time to go. Happy Wednesday!